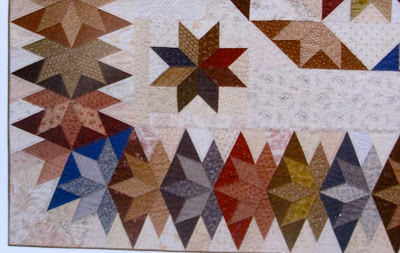 I finished the last of the blocks for the pieced border of Faceted Jewels today. All that's left is connecting the blocks then rows. 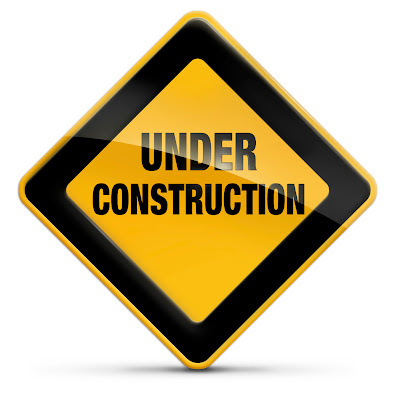 My goal is to have this top done before March 1st. I guess it all depends on how easy the blocks go together as to whether I make it or not. At this point, I've spent too much time and effort in all the pieces to ruin the whole thing by rushing to get them all connected. The date's only important in my mind. When I get close to the finish line on one quilt, I start thinking ahead to the next quilt I want to start on. I review the pattern, make sure I have what I need as far as fabric, and rewrite the pattern instructions in a way that suits me. When I finish one quilt I don't want to waste time trying to decide what to do next or the best way to go about it, I want to be ready to attack! 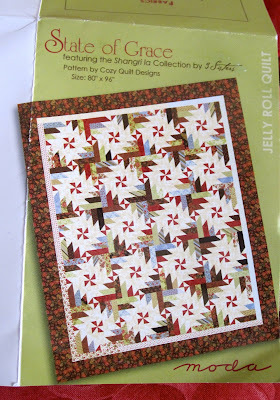 I've decided my next project is State of Grace that uses Shangri La by Three Sister for Moda. Awhile back I asked for some help with this pattern. I'm just not in the mood to draw all those lines on all those strips. Nicole uses the Angler 2 when she needs to sew angles and her work looks great. I'm also thinking about drawing the block, shrinking it down, and paper piecing it. This pattern calls for this jellyroll. Is it hard for you to untie these adorable little bundles? I'm guessing this roll is thinking, "free at last, free at last". My rolls think the same thing after I eat pizza and get out of my jeans. 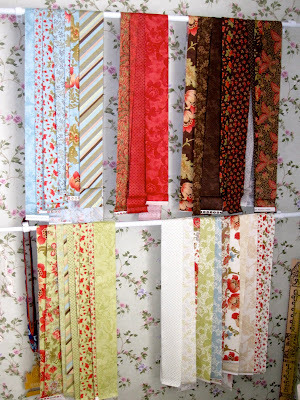 Here are the strips, breathing like fine wine, in my sewing room. I just love looking at them while I consider the possibilities. I'm thinking of going with a controlled scrappy on the blocks, making them all in one color way...you know me and scrappy! I've got at least 3 more days to change this pattern at least a dozen times before I get to actually start on it. 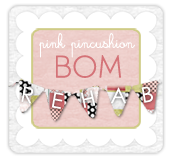 Stay tuned, who knows what I'll end up doing! Yesterday, waiting for me on my front porch from the mailman, was my October Schnibbles project, Cindy Lou Who, that I named, One Star Two Star Red Star Blue Star. It's all quilted and bound. 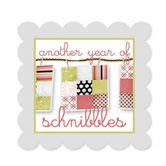 For those of you new to my blog, I chose to super size my Schnibbles. 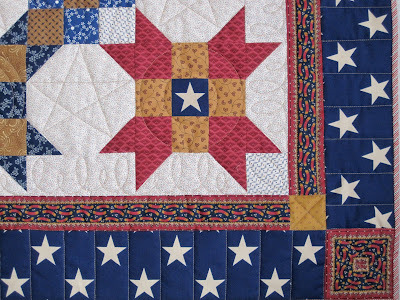 There's a little bit of everything going on with the quilting, the red stars are quilted with a circular design and the blue stars are quilted in the ditch. The snowball blocks have a star design. The outer row has doodles. Here's a closeup of the border design. I'm sticking with my original plan of buying a white coverlet for my king size bed, and positioning this quilt in the middle of it. Probably during the month of July. I got something else in the mail, a surprise! This is the entryway of my house. Unless it's Christmas, my furniture surfaces are pretty much knick knack free. I received this unbelievably beautiful doily in the from a fellow quilter, Dortha, who won one of my giveaways. 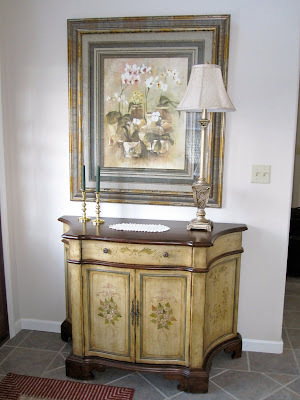 I have nothing like it in my home and I just love it! 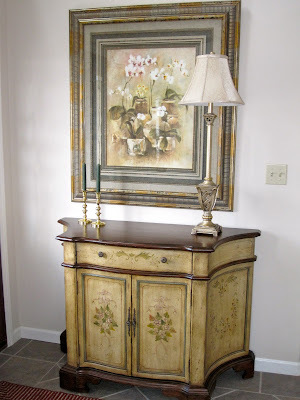 It looks perfect in my entryway, welcoming folks who stop by. I was really needing a little sumpin' sumpin' for that space. Dortha, thank you so much for the doily, it was very thoughtful and deeply appreciated. I'm still using Yoda for my post titles....sure you noticed, am I. The pieced border for Faceted Jewels calls for 100 tricolor flying geese. Another first on this quilt for me. I go back and forth between Eleanor Burns' rulers and Open Gate's rulers for making geese. 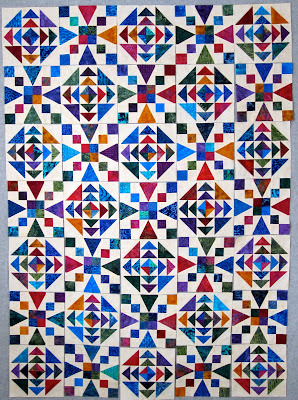 Eleanor Burns' rulers don't allow for a mixed sky so I was glad I had another method that I was familiar with and could use. So if you ever need to make tricolor geese, this is the ruler for you! Several folks left comments on my Hibiscus at My Caribbean Cabin post about Judy Martin having a new book!! That was news to me, thank you!! I got right on that little tidbit. Here it is, Stellar Quilts......I'm loving these quilts, I'm loving these quilts so much that I can't even imagine changing them up!! As a matter of fact, I love all the patterns. Plus the book shows different layouts and color ways for each pattern. This book must have over 100 different options/patterns in it! I couldn't come up with a different take on any pattern if I tried, Judy has done it all! The patterns look complex, but I like a challenge every now and then. The perfect setup would be a week retreat with Judy as an instructor. If anyone hears of one let me know. In the meantime I may have to figure out how to have a week retreat at home! 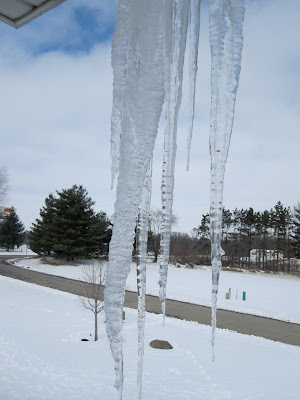 I heard on the news that 50,000,000 Americans have been impacted by the snow storms hitting the nation. So while I may not be special, I still think the snow sure is pretty. Looky what I made....my first Tuffets!! 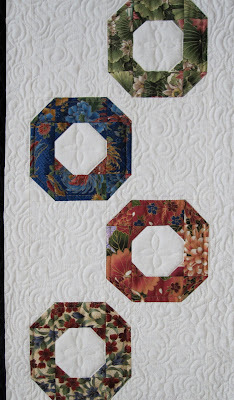 I used Maison de Noel scraps, and I mean scraps, to make these. I was surprised that it took me pretty much all day just to make 3. But I think it was time well spent, I'm pleased with how they turned out. I'm also glad I got around to trying out the Tuffet pattern because now I have a better idea of what I should be keeping instead of throwing away. In the past I would normally only keep strips and larger pieces of leftover fabric, but these tuffets can be made out of fabric that usually goes into my trash. So now I'll have two bags of leftovers, large pieces and Tuffet pieces. I used crushed walnut shells to fill them. The Maison de Noel family of fabric came with linens, cottons and velveteens. The velveteens made horrible geese but great backs for Tuffets. 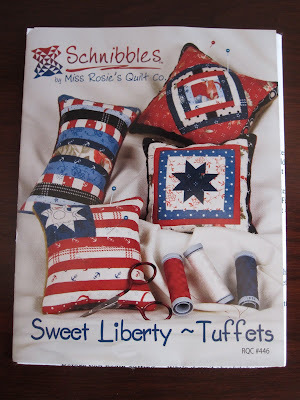 I'm hoping to make tuffets from all my finished projects . I'm still trying to decide what to do with Paprika but have really appreciated your comments. Yes, I agree, your eyes don't have any place to settle when you look at those blocks. I think I have too many print fabrics. As someone told me, "you need some prints that read as a solid". 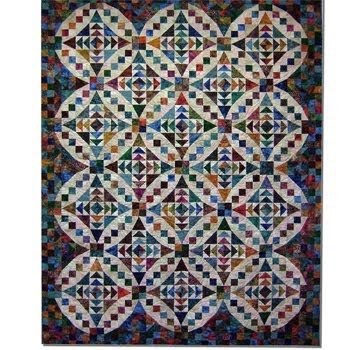 I also really liked what Quilter Kathy said, ask the quilt "what do you want from me". Right now I want Paprika to appear less busy and Paprika wants me to accept her as she is.....we'll keep talking this weekend! Right here in River City! With a capital "T"! That rhymes with "P". And that stand for Paprika......well I think The Music Man thought "P" stood for Pool......but you get my drift!! Paprika.....remember the lovely 19th Century Reds fabric and Fons and Porter pattern I picked up at "The Road to California" show? Here's the picture I took at the show. I wasn't in any hurry to get to it, but knew I wanted to make it this year. I don't have any particular deadlines on any of my projects, but it must be my Accounting background that makes tend to go FIFO (first in first out) when it comes to my projects. I do my older ones before my newer ones. 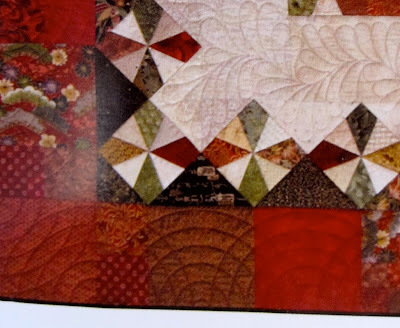 But Lesly/Pickle Dish also fell in love with this quilt and asked me if I was interested in doing a sewalong. I had so much fun with Toulouse I said sure, and switched from FIFO to LIFO (last in first out). So I unscrambled the light blocks, each individual block has the same fabric, but the blocks are made of different fabric. A controlled scrappy. I like it. I left the dark blocks scrambled, I don't like that. This is block 'B".....I love it..nothing to change here. This is block "A", how the pattern calls for it to be made. I don't like the center. So I tried something else, I don't like this either . . . . . So I tried this, and I don't like this either.....too much red maybe? So what's up? What am I missing? I feel like the problem is the center of block "A".. but maybe not. Maybe the problem is me..... and the quilt is fine. But I'm just not loving it. I'm going to get my hair done this morning and when I get home I'm so hoping someone has left the perfect solution for my quilt. And I hope it's not put it in a box and forget it! !